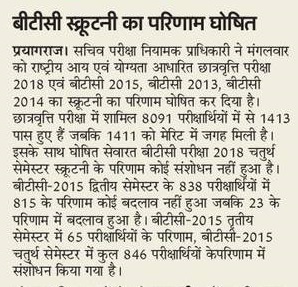 UP BTC Scrutiny Form 2019 More than 12,000 Candidates from BTC 2015 Failed due to not getting relevant marks in BTC 2015 3rd Semester exam. So Now many candidates eager to know the dates of D.El.Ed Scrutiny Form 2015. BTC is now called D.EL.ED, and D.EL.ED is working in all states of India. National council of Teacher education said D.EL.ED is the best course of becoming primary Teacher Recruitment 2018. UP BTC Compartment Form 2019 :- To make correction in your BTC 2015 Papers or to give written exam of D.EL.ED Back Paper Date, 2018. You need to subscribe our official web portal. We daily update the BTC Related topics on Recruitment, Exam, Admission, and Career in Diploma in Elementary Education etc. BTC Scrutiny Result 2019: On 20 March BTC Scrutiny result is out now from exam regulatory authority official website. In this scholarship exam total 8091 candidates apply in which 143 candidates passed and people who are in merit list their number is 1411. BTC Scrutiny result for year 2013, 2014, 2015, 2018. For More details you can reach our below posts. 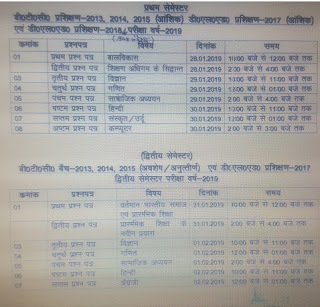 UP BTC 1745 Scrutiny Result 2019: Board has published D.EL.ED Result on 21 January in which 1745 candidates passed and 17510 candidates still on hold. Total 19255 BTC students filled application form of BTC Scrutiny. BTC 2015 Backpaper News: More than 25,000 Students of BTC 2015 Last Semester got back in written exam which result them not to enter in Assistant Teacher online recruitment process. Many students claim 7 to 9 marks were given in their ENGLISH and Maths papers. They said copy BTC 2015 4TH Semester check by un experienced people. 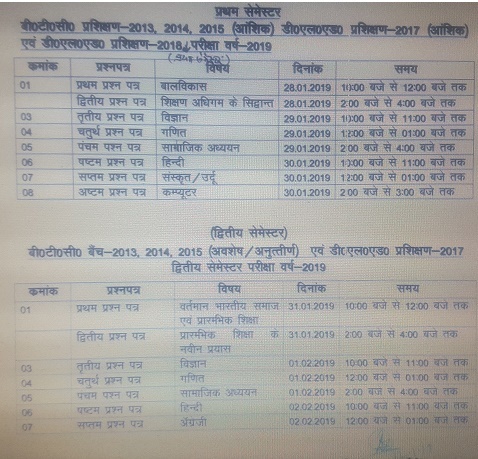 BTC Exam 2015 Result: On Tuesday BTC 2015 result late night evening announced in which 1/3rd students are fail. So if you wanted to take more details on how to check btc 2015 result you may read below number of students failed in written exam, how many passed and how many students give btc back exam in 2019. UP BTC Backpaper Scrutiny Latest News 2018: Candidates you have only 4 days left to apply D.EL.ED Scrutiny and backpaper also decided. You must fill form of scrutiny last date 27th Nov 2018. Exam Date: 1 December 2018. Scrutiny last date: 27 November 2018. BTC Exam.in In this portal you can check all update and time table, download admit card of BTC semester exam in upcoming time or days. BTC 2015 4th Semester Exam Date: Latest News of 13th October which all 8 papers held on 1.11.2018, 2.11.2018 and 3.11.2018, ( Previous exam 8 October to 10 October). 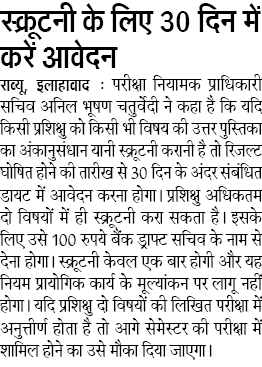 BTC 4th Semester 2015 Exam more updated is given below in all leading news of Dainik Jagran, Epaper Hindustan, Amar Ujala. BTC TET Result: 10 December 2018. UP BTC Appearing, Pursuing: - Honorable Supreme court will talked decision on 50,000 BTC Teacher who filled form as Appearing Candidates or Pursuing. Supreme Court said many candidates in Uttar Pradesh get jobs through Appearing or pursing course in DIET, Private College o BTC. After Declaring BTC 3rd Semester exam many candidates highly requestion to declare written exam date of 4th Semester. So that they can take part in BTC 4th Semester exam. 1. For BTC Failed Candidates 12,000+, there will be do or die for them because UP Government soon published 97,000 teacher vacancies in utter Pradesh. 2. 83% passed in BTC 2015 exam and rest of 17% Failed. 3. 50,000 Teacher career decided by supreme court on 25 September 2018. Their TET passed certificate may also be cancelled.